Ciaran Martin is a third year mechatronic engineering student from Blanchardstown, Dublin. 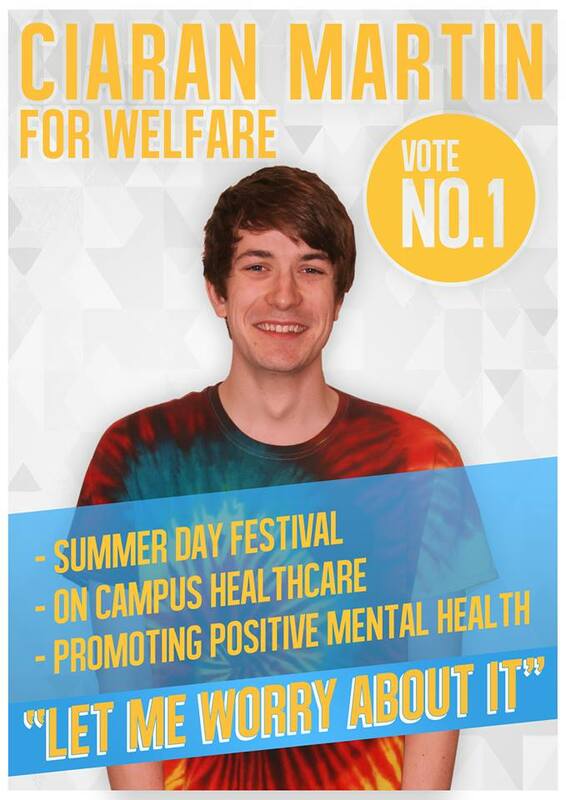 If elected as Welfare Officer he wants to organise a summer day festival, an all-day event instead of just a Summer Ball at the end of the year to include stalls and bands playing around campus before a ball in the evening. As part of this he wants to organise bigger international line-ups for the summer ball as well as the Fresher’s Ball. Why are you personally running for Welfare Officer? I’m running for it because I’ve had my eye on it since first year, I’ve wanted to run for the SU since first year. This year I’m repeating third year so it’s the perfect time for me to go for it [Ciaran plans to defer his final year of study if elected]. The reason I picked welfare is because all my involvement in clubs and societies has all been revolved around people’s welfare, like organising trips and organising events. It’s all been based around making sure everyone is as happy as possible with the event, for everyone involved, even the organisers so I want to do that campus wide rather than just in the confines of a society. One of the main responsibilities of welfare officer is dealing with helping people with personal problems. What skills and attributes do you have that makes you suitable for this role? I’m quite good at planning campaigns for example Mental Health Week and all of the weeks we have to go through and following through with plans, making them early and adjusting them as much as possible to suit everyone involved in them. So I think that will be very useful when I’m actually dealing with campaigns to help students. What do you think is the most pressing welfare issue in DCU that needs to be addressed next year and why? And how would you deal with if elected? I think it has been dealt with very well over the last two years but mental health is still a major issue. This year I think was more focused on letting people know that it’s okay to get help but I want to focus more on helping friends recognise mental health issues in their friends so recognising it early because there are plenty of people who have mental health issues who just can’t get up the courage to tell people about it, get your friend to kind of notice it or if it gets too bad they can help you with it, they can intervene with you and help you get help with it. Imaginary scenario: A student is working part-time to fund their college education but falling behind on coursework as a result. They can’t quit but are stressed trying to balance both. How would you help them? One of the first points in my manifesto is actually to have time management workshops at the start of semester, well just before the start of semester as part of orientation and fresher’s week and then just before exam study period in both semesters so that people can plan. Obviously they’d be free workshops not only for time management but for stress and study as well. Some people’s courses, they might have done INTRA for a year and be out of sync with studying so to help them learn how to study again which is obviously a great way of relieving stress because that’s where a lot of stress comes from for students. So time management workshops and stress management workshops as well. How do you think Lorna Finnegan has performed as Welfare Officer and what would you have done differently if you’d been in office this year? I think she’s done a great job. I’ve obviously thoroughly read her manifesto from last year and she hasn’t really strayed from it much at all. One thing I’d do differently, I know she tried to fix it but it’s pretty much dying in DCU is RAG week. She tried to move it back to the first semester which was a good idea in theory but still I don’t think it really worked very well. What I want to do is get rid of RAG week but rather than having one week dedicated to Raising and Giving have events split over both semesters because my theory is that they might be asking students for money but the student might not necessarily have money that week where as if there’s RAG events split over the year they might have no money to give for one but they might have gotten paid the day before the next one so that’s one thing I changed. 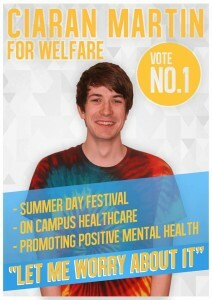 Why should students vote for you as SU Vice President for Welfare? Who will you be voting for? Tell us in our poll. Welfare: Catherine Conneely on student support and doctor’s fees. Welfare: Eve Kerton on Access Service cuts and sexual health.